God saw that the time was ready for Jesus to come to our world. Before coming to our world, Jesus lived with the Father as the second person of God. [Yet, we serve "One God", not three Gods.] It is a relationship that humans cannot fully understand here in this world. Jesus grew up in a poor, but real human family. Jesus had brothers, and likely sisters. 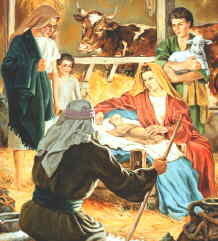 History tells us that Joseph’s first wife had died. Jesus worked with his father in the carpenter shop until the age of 30. At the age of 12, when he went up with his family to religious meetings in Jerusalem, Jesus began to realize more fully His mission in life. Jesus got into great discussions with the Jewish leaders. Finally in 27 A.D., right on time according to Daniel’s prophecy, Jesus went to the Jordan river where his cousin was baptizing people. John the Baptist was preparing people for Jesus coming. John the Baptist called the people to repent. As our example, Jesus was baptized. When Jesus came out of the water, the Holy Spirit rested on him like a Dove. Right after His baptism, Jesus was led out into the desert. Here God allowed Jesus to be tempted directly by Satan. Satan knew that if He could tempt or trick Jesus into sinning, man would be his possession. Jesus and man would all die. This death would be an eternal death. The three separate temptations Jesus suffered in the desert are ones like our temptations. Jesus was tempted, but He answered Satan with an "It is Written" from Scripture. [Matthew 4:4] Satan did not give up easily. As the master-mind of false Bible study and understanding, Satan also quoted the Bible. But, Jesus passed the test. By depending on His Father for power, Jesus showed us how we can also have victory over Satan’s temptations. Then seeing how weak Jesus was from his 40 day fast and the time of temptation, God sent an angel to give Jesus strength. 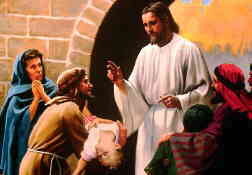 Jesus taught, preached, healed and He worked to prepare a small group of twelve "disciples". It was really Heaven’s University for training church leadership for God’s new plan. Jesus took the Disciples with Him from the Sea of Galilee in the North, to Jerusalem in the South. The disciples learned lessons of humility, courage, trust and dependence on God. They were educated "on the job" with the world’s Creator as their Professor. Three and a half years later, again on time in God’s planning, Jesus was taken captive by the Roman soldiers. 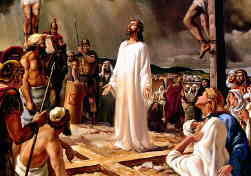 Jesus was given a poor trial before the Jewish and Roman leaders. The Roman ruler, Pilot, did not really believe Jesus was guilty, but the Jews said He was. Pilot bent to pressure, and had Jesus crucified between two robbers. The Creator of the Universe was put to death by the people He created! Just imagine the feelings of rejection and discouragement that could have tempted Jesus. Satan spoke through the rulers when they told Jesus to prove that He was God. If Jesus would come down off the cross, the leaders said would then believe Him. What a temptation to prove His Divine power when any second Jesus could have called ten thousand angels there to help and deliver Him! Instantly, Jesus could have destroyed all those who had called for Him to be crucified! Why didn’t He? Because He was thinking of us – He must die in our place to save us. Jesus was the "Lamb of God" -- the Divine substitute sacrifice dying to take away our sins. This is the only way you and I could be saved! Really, Jesus died not just an ordinary death like us, but the "second death" like the wicked will finally suffer. Remember how Jesus said that His father had forsaken (left) Him. Of course, the Father did not really leave Him. 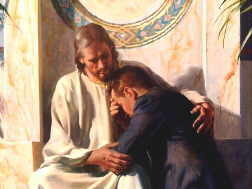 The Father was there watching and suffering with Jesus. But, your and my sins so separated Jesus from His Father, that it seemed Jesus was left to die alone without His Father. This separation was what really killed Jesus! "Dear Jesus, I have lived for myself, and not for you. Today I see my selfish ways are not right. I can’t save myself, but you can. Please forgive my sins. Come and be my Lord and King. to come and live in me. I ask the Holy Spirit to change me to be more and more like Jesus. Please don’t ever leave me, for I want to be fully yours. I ask in Jesus name, Amen." You sincerely offered this prayer? Then you now belong to Jesus! Share what Jesus has done, and is doing for you! Yes, you will make mistakes and you may fall down. All Christians do. But, like a baby, a Christian gets up again when he falls (sins). A Christian asks for forgiveness and follows Jesus again. [1 John 1:9] Share your new experience in Jesus with others. Do it with care and love. Don’t preach at people. People usually like hearing a personal story of victory if told at the right time and place. Lift up Jesus, not yourself! If you have just now accepted Jesus, we would love to know your story. Do write and tell us. We would like to share your joy in Jesus! Contact Us Now! After Jesus died, He did not stay in the grave. Jesus was raised to life again. Jesus spent a short time teaching His disciples. He wanted all his followers to have plenty of evidence that it was the same Jesus who came back to life. Jesus taught that His resurrection is a sample of how all God’s true follows will rise again in the great resurrection at Jesus Second Coming. About six weeks later, Jesus went back to Heaven. While Jesus followers watched Him go up, an angel told them that this same Jesus would come again, just like He left. That is the promise to help keep us holding until Jesus returns! God had many plans for His disciples. They were to take the Good News of Salvation, the "Gospel", to all the world. Go to the Next Section: God's New Plan For His Work.